Visitors to the industrial exhibition at the ITER Business Forum (IBF) last week were treated to an unusual sight at ITER: a display featuring Canadian nuclear companies. ITER history buffs will remember that Canadian industrialists and academics proposed a site for the ITER Project in Clarington, Ontario, only to withdraw their bid in 2003. But last year, hopes were rekindled when in April 2018 the ITER Director-General and the Canadian Minister of International Trade signed a Memorandum of Understanding agreeing to explore the possibility of future cooperation. As the IBF discussions demonstrated, Canadian industry is both versatile in its range of capabilities and keenly interested. 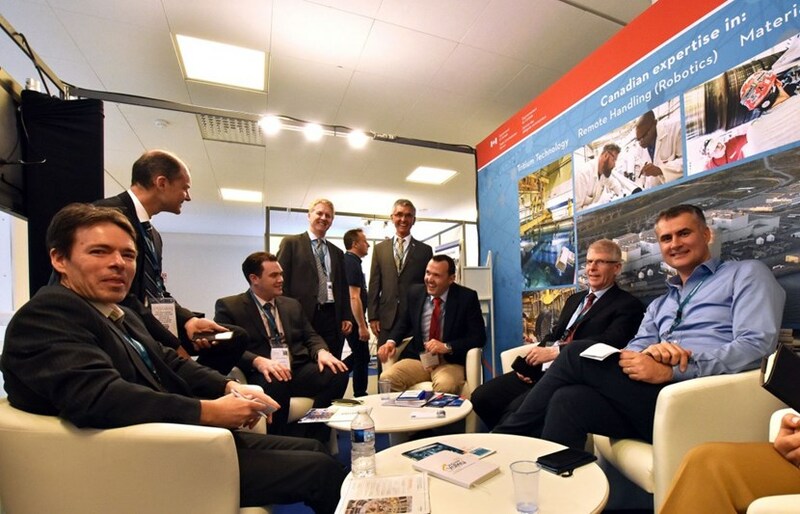 Representing both national organizations and industry, the large Canadian delegation included specialists in tritium handling and recycling, remote handling and hot cell management, and complex project management. Prior to arriving at IBF/19, the Canadian delegation visited the ITER site, where they met with Director-General Bernard Bigot and toured the ITER construction platform. As often happens during tours, the participants walked away visibly impressed. To quote Dean Townsend, the Vice President of Engineering Strategy for Ontario Power Generation (OPG): "The scale and complexity of the facilities we visited were truly awe-inspiring, and demonstrated to us how the best engineering and construction talents of many nations can be harnessed to achieve monumental results." The delegation itself came from multiple sectors: the group was coordinated by Ron Oberth of the Organization of Canadian Nuclear Industries and was rounded out by the Canadian Trade Commissioner in Paris, Denis Trottier in addition to OPG. Ten leading Canadian industrial suppliers participated, ranging from ATS Automation and Rolls-Royce Civil Nuclear Canada to Laker Energy Products and Tyne Engineering. Corporate specialties included tritium handling and recycling, remote handling and hot cell management, and complex project management. Canada's academic sector was represented by Jerry Hopwood, president of the University Network of Excellence in Nuclear Engineering. And the mission to ITER and IBF/19 was funded by Global Affairs Canada, the federal ministry that oversees foreign affairs. What happens next? As with any new country interested in participating in the ITER Project, such decisions rest exclusively with the ITER Council and require unanimous consent. Discussions so far remain at the exploratory stage. But the palpable enthusiasm of ITER's newest visitors suggests that motivation is strong to see whether Canada can once again become part of the world's most complex scientific endeavour.